The earliest Russian buildings in the Holy Land are, first of all, the building of the Russian Ecclesiastical Mission in Jerusalem with the house church of the holy martyr Queen Alexandra. 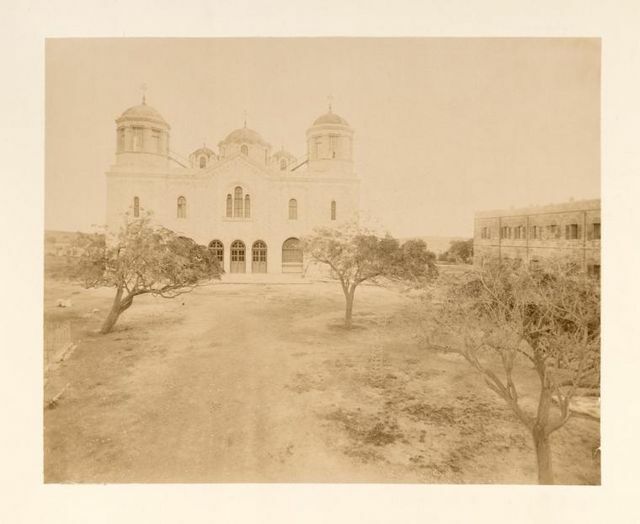 General view of the building of the Russian Ecclesiastical Mission and the Trinity Cathedral in Jerusalem. © Archive of the Jerusalem Branch of the IOPS (Imperial Orthodox Palestine Society). The Russian Spiritual Mission was established by the Holy Synod of the Russian Orthodox Church back in 1847. After visiting the Holy Land by the Grand Duke Konstantin Nikolaevich in 1859, Russia purchased a huge plot of land west of the Damascus Gate on Meidam Square, which is now commonly called the "Russian Compound". In 1859, the Petersburg Committee established the Petersburg Committee, which Grand Duke Konstantin Nikolaevich Romanov headed. August 30, 1860 in the center of this site laid the future Holy Trinity Cathedral, which is the central temple of Russian buildings, the construction of which stretched for 12 years. General view of the building of the Trinity Cathedral in Jerusalem. In parallel, the construction of the building of the Russian Ecclesiastical Mission in Jerusalem with the house church of the holy martyr Queen Alexandra, as well as shelters for pilgrims, a hospital building and a house for the Russian consul were started. The construction of these facilities was carried out by the Palestinian Committee at the Asian Department of the Ministry of Foreign Affairs of the Russian Empire. The main author and architect of Russian buildings was Martyn Ivanovich Eppinger (1822-1872). Builders of Russian buildings in Jerusalem (1859-1864). The building of the Russian Ecclesiastical Mission in Jerusalem. 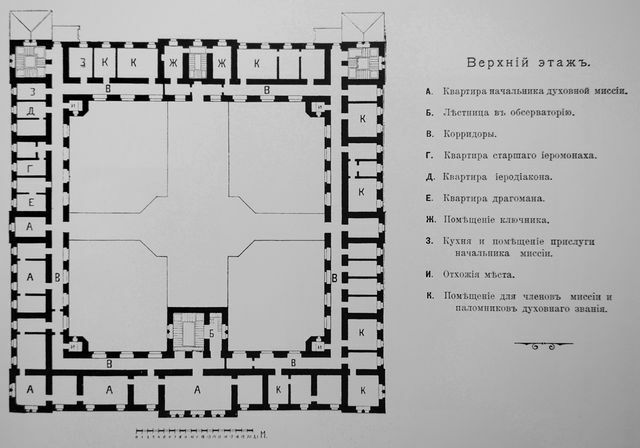 Schematic plan of the building of the Russian Ecclesiastical Mission in Jerusalem in 1907. Lower floor. 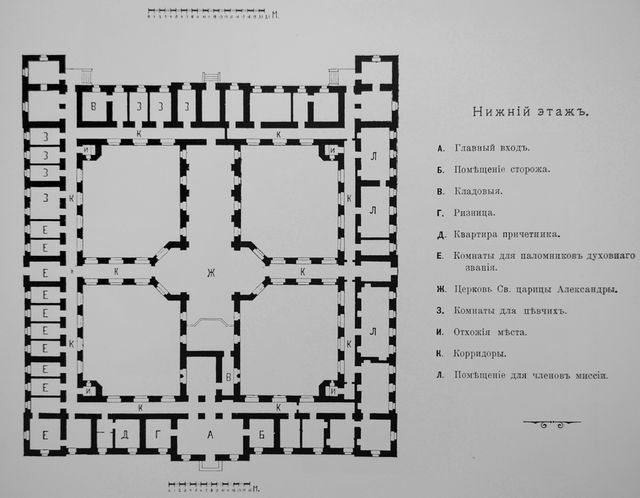 Schematic plan of the building of the Russian Ecclesiastical Mission in Jerusalem in 1907. Top floor. The house church was located crosswise in the center of this complex. Originally, the construction was planned to be completed by 1863, but since Church of St. Martyr Alexandra was not yet fully ready, construction was postponed until 1864. The church was decorated with a carved oak iconostasis, icons and four gilded kiotas for which 31 thousand rubles were spent . 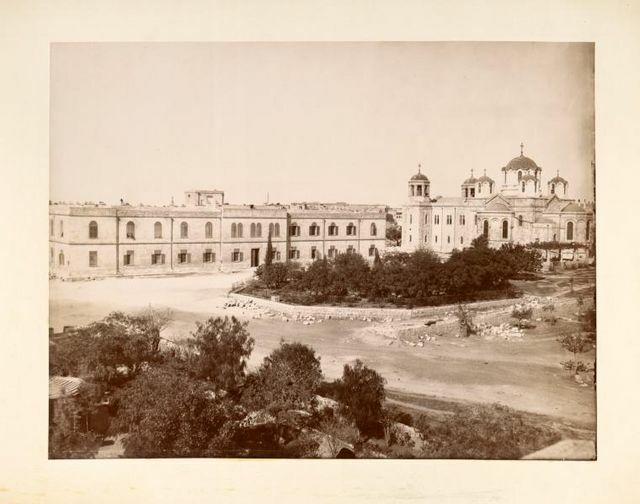 Consecration of the temple along with other Russian buildings: the Mission building, hospice houses and a hospital was held June 28, 1864, with the head of the Russian Ecclesiastical Mission in Jerusalem, Archimandrite Leonid (Kavelin). On the eve of the solemn Grand Vespers in the presence of the Patriarchal governor Meletiy, Metropolitan Petra of Arabia, invited to the celebration by the head of the Mission at the request of the Synod of the Russian Orthodox Church. The house church of St. the martyr of Queen Alexandra in the building of the Russian Ecclesiastical Mission. "At one o'clock in the morning on June 28, they phoned to matins, and at 2 o'clock in the morning matins began. After singing Glory in the highest God Metropolitan Meletios with all the clergy came out of their church with litany, three times bypassing the house of the Mission and reading each time against the western Gospel. At the end of the procession, the order of the consecration of the church began and then the Liturgy followed, to which crowds of worshipers of different nationalities gathered: Russians, Bulgarians, Greeks, Arabs, Copts, Abyssinians were present. The divine service performed, as well as on the eve, by singers Greek and Russian, ended at 9 o'clock in the morning. At 12 o'clock in the afternoon in the man's worship shelter a solemn dinner for 125 people was held ". Thus, the house church of St. the martyr Alexandra became the first Russian church in the Holy Land. 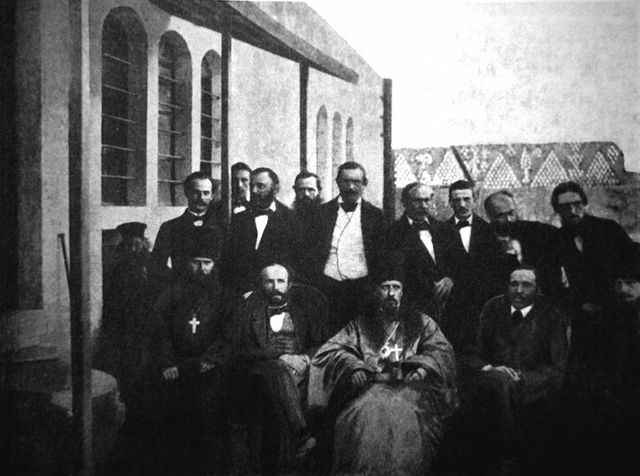 In the building of the Russian Ecclesiastical Mission in Jerusalem in the pre-revolutionary period lived such prominent religious figures who contributed to the work of the Russian spiritual presence in the Holy Land as Archimandrite Antonin (Kapustin) - Head of the Mission from 1865-1894, Archimandrite Leonid (Sentsov) - Head of the Mission 1903-1918. 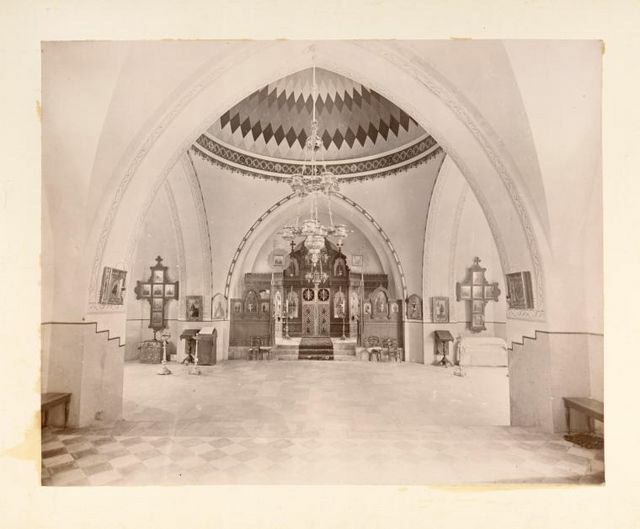 When Father Antonin (Kapustine) in the building was a museum of Palestinian antiquities, part of the collection of coins of which is still in St. Petersburg in the Hermitage Museum in the collection of coins of ancient Rome and Byzantium. He had a telescope on the roof of the Mission building, through which he watched the heavenly lights. 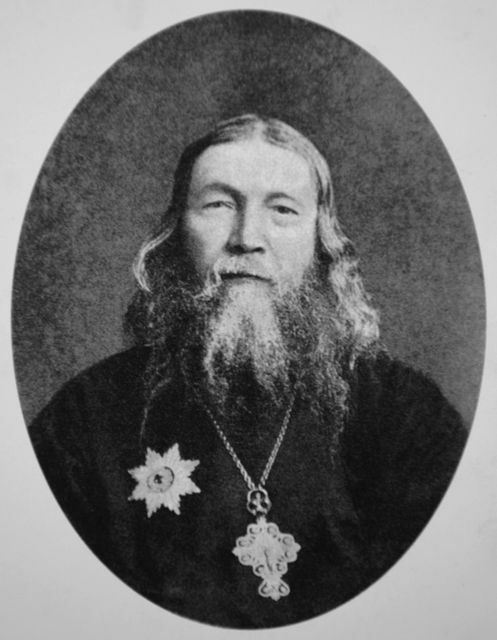 Archimandrite Antonin (Kapustin) - Head of the Russian Ecclesiastical Mission in Jerusalem (1865-1894). 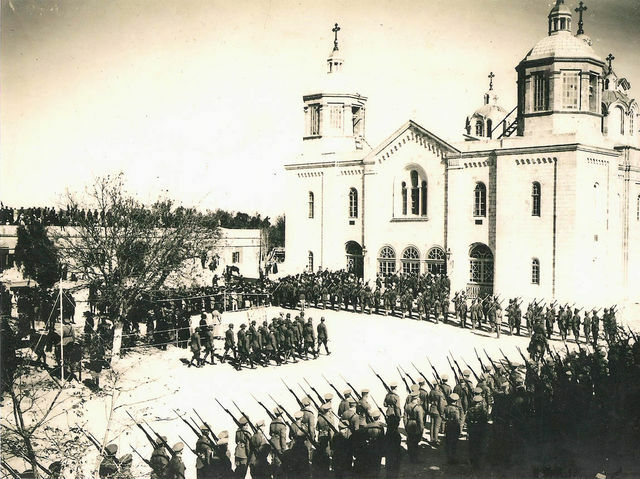 In 1914, the building of the Mission, like all Russian buildings in the center of Jerusalem, is occupied by Turkish troops of the collapsing Ottoman Empire, which have their administrative structures there. The situation of the Russian people who found themselves at this time in Palestine is significantly deteriorating. Turkey participates in the First World War against Russia on the side of Germany. In view of the severance of diplomatic relations between Russia and Turkey, the Russian consul leaves Jerusalem and his duties are performed temporarily by the Spanish consul. The Imperial Orthodox Palestine Society informed all Russian pilgrims that the maritime communication between Russia and Palestine was discontinuing. Some of the pilgrims departed with the last steamships to Russia, and some in the hope that soon the war will end and Russia will win it, remained in Palestine. Many remained because of the fact that there was simply nothing to sail to Russia . The Head of Mission, Archimandrite Leonid (Sentsov), was deported with other members of the Mission. In 1917, a revolutionary catastrophe occurs in Russia, and members of the Mission return to Jerusalem, only in 1919. Archimandrite Leonid did not live to this point. He died in Moscow in 1918, where he took part in the meetings of the Local Council of the Russian Orthodox Church, leaving in his spiritual will, the numerous land plots he acquired in the Holy Land. The Mission building for these 5 years was supported by the efforts of the temporary church administration and the efforts of individual emigrants and IOPS figures who remained at that time in Palestine since 1914 . The Mission building underwent plundering, in particular, a significant collection of valuable coins from the Museum of the Palestinian Antiquities from the collection of Archimandrite Antonin (Kapustin), as well as the furnishing of the building and other valuables, has disappeared. Since 1917, the British have been replaced by the Turkish authorities. The building itself was run by the British Mandate over Palestine. In 1919, the Supreme Mandate Court of Palestine entered the greater part of the Mission building, which occupied it until 1948. For the needs of the Mission left the church of St. the martyrs of Queen Alexandra, a meal, about half the lower floor and several rooms on the second . Hieromonk Meletios was appointed the acting head of the Mission in Jerusalem. He enters into the cadastral books all the Russian sites included in the will of Archimandrite Leonid (Sentsov) . In 1921, the financial situation of the Mission became catastrophic, as the Mission was in numerous debts caused by the purchase of significant areas of immovable property before 1914, in the hope that it would be possible to cover these debts through the new arrival of pilgrims' caravans to Palestine. The higher Church Administration sends Constantinople from Metropolitan Anastassy, ​​who leases Russian buildings to the British authorities. 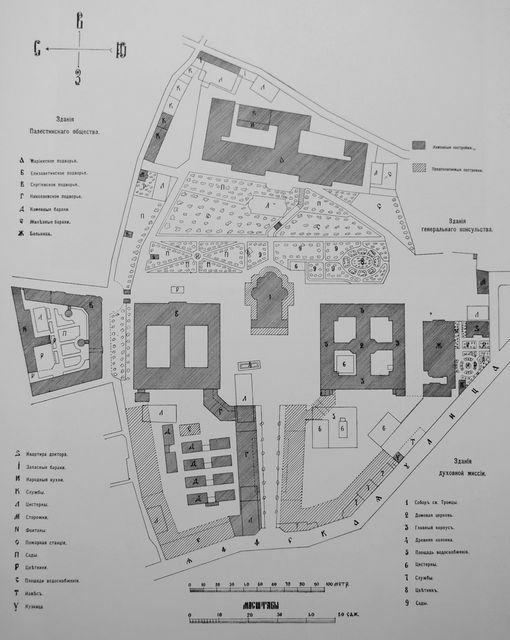 The Mission building and other Russian buildings were occupied by them and rented for very different purposes, such as the deployment of the Spanish consulate and the Palestinian Mandate Court, to warehouses, hospitals, prisons, and even barracks and warehouses of the British gendarmerie. Until 1948, the Mission building was in the jurisdiction of the ROCA (Russian Orthodox Church Abroad), the members of the Mission occupied a small part, the rest was occupied by a British court, and by Russian buildings by 1948 the British authorities organized a military town "Bevindrad", surrounded on all sides by barbed wire. "Bevingrad" during the British Mandate over Palestine in 1917-1948. View from the side of Jaffa Street to the Nikolaevskoe podvorye IOPS and the Holy Trinity Cathedral. and Elizabeth's home of the IOPS. (Photo about 1917). From the prominent figures of the Russian Diaspora in the building of the Russian Ecclesiastical Mission, from 1928 to 1931, Archimandrite Kiprian (Kern), the head of the Mission of Russian Orthodox Church Outside Russia (ROCOR), lived the author of the well-known monograph on Antoninus' father, Archimandrite Antonin Kapustin, the head of the Russian Ecclesiastical Mission in Jerusalem. From 1933 to 1948, the Mission was led by Archimandrite Anthony (Sinkevich), at which the magazine "Holy Land" was published. The journal was published before 1940 and published in spite of some ideologization of many interesting articles on church archeology and the history of the Holy Land. We expected death and watched from what side the new owners would break into. Almost immediately Israeli soldiers broke into the second floor, and we heard their footsteps. But in the Mission itself, no one appeared for two hours, and at that time we felt condemned to death. Our existence in the Mission was more than depressed, as we felt like half-voices in our own house! Everything happened on the command of the Israelis, who externally treated us mostly (but not always) with a strained politeness. We were not so much afraid of shelling, as much as possible revenge, although the shelling was very strong. Fortunately, the two churches of the Mission suffered only roofs, but inside everything remained almost intact ". "The condition of the churches and the structure is terrible. From the former comfort there was no trace. There are traces of hostilities everywhere. Inside the buildings a complete mess, soldiers were placed here. Much has been stolen, the rest is broken. The walls are scratched and some have been beaten from mines. Glasses everywhere - in temples and in living quarters, the locks were knocked down, the doors were broken, the office archive was scattered, the furniture was disfigured, the table linen, the dishes were stolen. In general, when we arrived, it was scary to enter the building: it's dark in the corridors (we arrived at 7 pm), the wind bursts in broken windows, echoes echo, the people are all around, at night it's terrible to open the cell and go out into the corridor ". From this moment a new period begins in the life of the Russian Spiritual Mission in the jurisdiction of the Moscow Patriarchate. On December 5, 1948, Archimandrite Leonid made his first divine service in the church of St. the martyr Alexandra. Gradually the building of the Mission began to be restored. In 1952, Archimandrite Meletiy died, who was a live connection of the Mission until 1914. He was buried in the cemetery of the Gorny Monastery. Before his death, the Mission noted his 80th birthday and he was awarded a patriarchal letter. From 1956 to 1958 years. in the Mission served as Archimandrite Nicodim (Rotov) - the future Metropolitan Nikodim (Rotov), ​​who gathered during his stay, including the head of the Mission, a lot of materials on its history and in 1959 prepared a course essay "The History of the Russian Ecclesiastical Mission in Jerusalem" for which he was awarded a degree of theology. The work included 500 typewritten pages, and the list of sources included more than 70 printed and about 700 archive files from the "Archive of the Russian Ecclesiastical Mission in Jerusalem, for which there are 651 references in the text of the essay." Nevertheless, neither in the Mission nor in the Department for External Church Relations of the Moscow Patriarchate did they manage to get an answer, where this archive of the Mission is located. The publication of this work took place only in 1998 on the personal initiative of Metropolitan Yu. Krutitsky . This continued the life of the Russian Ecclesiastical Mission in Jerusalem without much change until 1991, when the Soviet Union collapsed and pilgrimage and religious tourism resumed on the Holy Land. From March 6 to April 1, 1991, the Holy Land is visited by His Holiness Patriarch Alexy II and many pilgrims inspired by his example begin to visit the Holy Land. Since 1993, the Mission has been arranging reception of pilgrims in an organized manner, having formed a pilgrimage department in the Danilov Monastery in Moscow. The role of guide guides was performed by the nuns of the Mission and the Gorny Russian nunnery in Jerusalem. A new milestone in the history of the Mission begins. Traditionally, during the pre-revolutionary period, the Mission was concerned with the spiritual needs of pilgrims, pilgrimage was traditionally undertaken by the IOPS. Since the 1990s, the Mission has been actively engaged in the rehabilitation of its sites, preparing them for the reception of pilgrims. Nevertheless, the building itself is still 70% occupied by the Israeli world court. It does not solve the complicated tangled knot of the tragic 20th century. For several years now, negotiations have been held at the level of the Russian and Israeli Foreign Ministries related to the restoration of the rights of the Russian Ecclesiastical Mission (REM) and Imperial Orthodox Palestine Society (IOPS) to their historical property in Jerusalem. On December 28, 2008, after a series of difficult negotiations in Russia, the Sergievskoe metochion of the Imperial Orthodox Palestine Society in Jerusalem was returned to Jerusalem, two-thirds of which are still occupied by Israeli tenants. What will be the result of the negotiation process for the release of the building of the Russian Ecclesiastical Mission from tenants? Time will tell. See the photo archive of the Jerusalem branch of the IOPS on our portal "Orthodox pilgrim in the Holy Land"
 Boris Mansurov. Report on the measures taken to improve the life of Russian Orthodox fans in Palestine. St. Petersburg. 1860. p.44-70. "Russia in the Holy Land." Documents and materials Volume I. p. 237. Moscow. International Relations Publishing House.